Number bonds are simply pairs of numbers that add up to a given number. For example, the number bonds for 9 are 9 + 0, 8 + 1, 7 + 2, 6 + 3, and 5 + 4 (plus these with the two numbers switched). Number bonds for number X are all the possible combinations of two numbers with the sum of X. 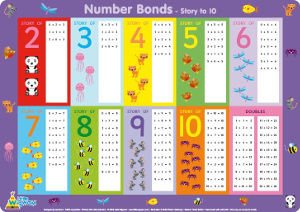 Number bonds help children learn the STRUCTURES inherent in the basic addition facts. Using number bonds allows children to approach addition facts from a conceptual point of view, instead of memorizing them randomly or in sets of +1 facts, +2 facts, and so on. All you need to do is show children how to make this pattern, and then let them write it all out themselves on a blank paper with various colors. It's great fun for children to understand the pattern! At first, you can help them by writing the list of numbers from 8 down to 0 (vertically). Here's a colorful poster for the patterns in the number bonds just like what I wrote above. However, I still feel it's far better for children to write the addition facts themselves – they can use lots of color to make it fun. You can also use the worksheets below to help children further practice number bonds and their addition facts. If the number you want a number bond worksheet for is not listed, use the generator to make a worksheet for that number yourself. Use the generator below to create a number bond worksheet for any number you like.